For long we have been witnessing a flat market, but the recent upward trend looks encouraging—thanks to cooling inflation and a dip in interest rates on the domestic front and positive cues from the global markets. Broadly, the rally was led by large-cap stocks. On a one-year basis, the BSE 100 index (the large-cap index) gave returns of 24.48 per cent. However, the recovery in mid-cap space has been slower. The CNX Mid-cap and BSE Mid-cap index returned 16.72 per cent and 11.18 per cent, respectively. On the back of a good run in the equity markets, mutual funds (MFs) did well too, but not all. However, because we have not witnessed any broad-based movement, the fund manager’s job has not been quite easy. The difference in returns between the best-performing fund and the worst in the mid-cap space is 27.24 per cent. In the past one-year, large-cap funds listed in OLM 50 returned 22.54 per cent, against the category average of 17.24 per cent. Birla Sun Life Frontline Equity stole the show with 32.08 per cent and was among the top five best performing schemes in the diversified equity fund category. 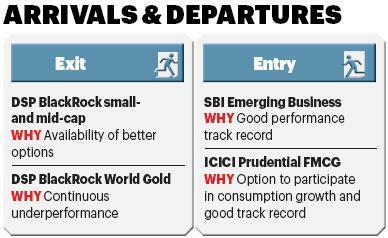 ICICI Prudential Dynamic and DSP BlackRock Equity missed the category average by a whisker. For DSP BlackRock Equity, a somewhat high exposure to mid-cap stocks went against it. The performance was sharper in mid-caps. 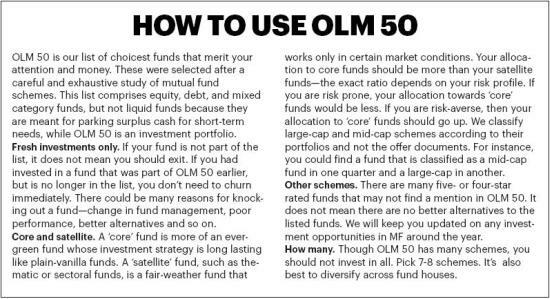 Compared to the one-year category average return of 17.96 per cent, OLM 50 mid-cap funds posted 23.03 per cent. 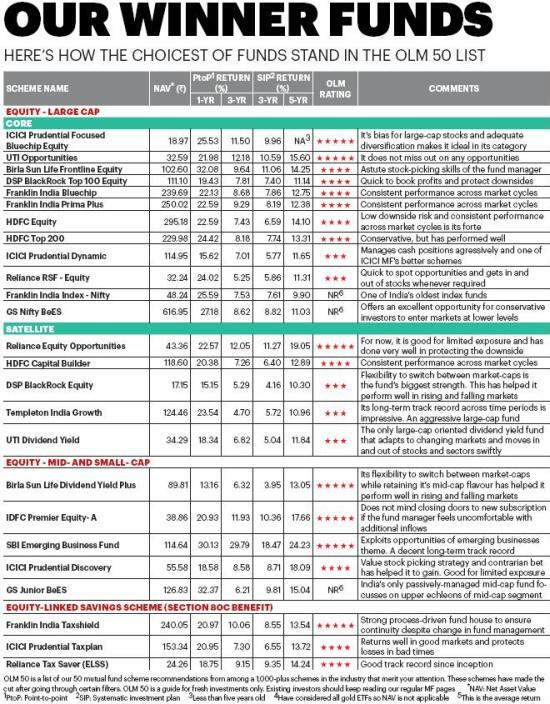 Benchmark MF’s GS Junior BeES—India’s first and only passively-managed mid-cap fund—was the star-performer in this category with the highest return of 32.37 per cent. Almost all funds in other categories also did well by beating their respective benchmarks and peers. 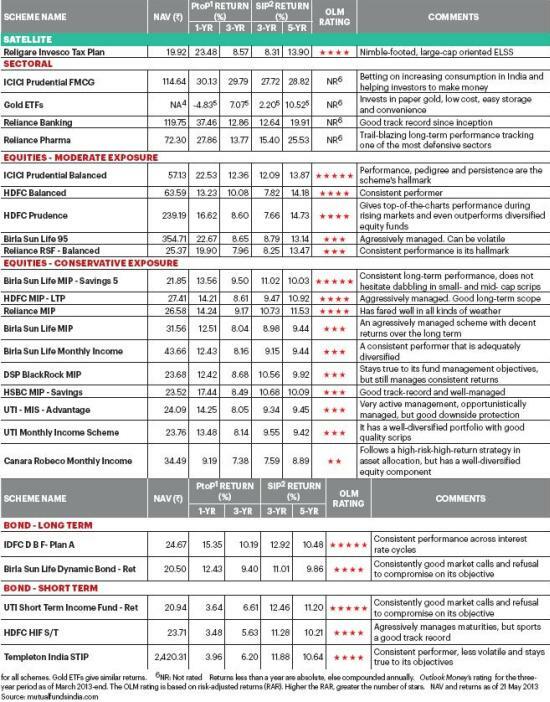 In OLM 50, among the 26 equity-oriented funds, six funds lost one star each in star ratings, while Franklin India Taxshield went a notch higher to become a five star fund.The rest retained the same star ratings. This is, however, not an alrming situation. In the balanced-fund category and monthly income plans (equities—conservative exposure), HDFC Balanced and Canara Robeco Monthly Income funds lost one and two stars, respectively. In the mid-cap space, DSP BlackRock Small- and Mid-cap Fund (DBSMF) were dropped, while SBI Emerging Business fund (SEBF) made it to the coveted list. Although DBSMF remains a decent option and existing investors should continue, we feel SEBF is a better alternative given its long-term record and objective. Given that it runs a bottom-up, high-conviction strategy, it has a bias towards mid- and small-caps over the past three years. We also included a fund from the defensive fast-moving consumer goods sector, ICICI FMCG, which replaced DSP BlackRock World Gold, an international feeder fund, because it did not perform for a long time. However, existing investors bullish on the yellow metal may continue holding it. The performance of the domestic fund is driven by the performance of the parent fund and the rupee-dollar exchange rate. As the broad equity market is trading at a higher level, investing in equity in a staggered manner would be wise. You may either choose the systematic investment plan (SIP) or systematic transfer plan (STP) to invest. Investors with a short-term investment horizon, say 2-3 years, might like to take advantage of long-term bond funds as the market is going through a falling interest rate scenario.